Amnesty International delivered a batch of life-size ‘bombs’ to Downing Street on Whitehall in protest at British arms deals to Saudi Arabia on Friday morning. The British government has supplied the Saudis with 2,400 missiles and 58 war planes in the last year alone, the human rights organization says, enabling it to continue its war against Houthi rebels in Yemen. British arms deals with the Saudi government have been branded unethical and in breach of international law. More than 6,000 civilians have been killed or injured in Yemen as a result of the fighting. 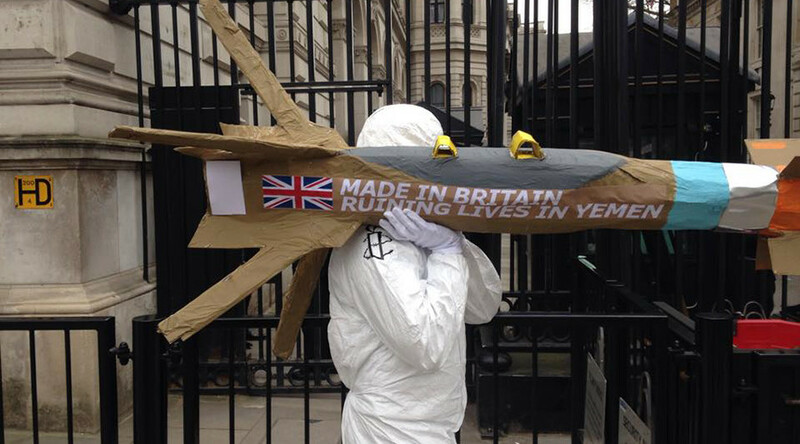 Amnesty carried five 1.8m long replicas of the Paveway IV missile, which had the words “Made in Britain, destroying lives in Yemen” emblazoned on the side. “We’re drawing as much attention as we can to the fact that the UK government is selling arms to Saudi Arabia and we absolutely know what is happening in Yemen, and where Saudi Arabia is in terms of the war in Yemen. “We’ve seen 3,000 people dead, 700 children, hospitals and schools bombed, and it is arms from the UK being sold to Saudi Arabia. It is breaking the international arms trade treaty. We want the UK government to stop doing that. It was announced last week that British arms sales to Saudi Arabia will be the subject of a parliamentary inquiry. The powerful cross-party committee on arms exports controls will also examine Britain’s arms sales to other Gulf countries. Conservative MP Chris White, who chairs the committee, said: “The defense and security industry is one of the UK’s most important exporters. However, it is vital that its financial success does not come at a cost to the nation’s strategic interests.